Daily Commentary – Thursday, October 13, 2016 – Will “Unshackled” Donald Trump Not only Lose the Presidency but the Senate and House as Well? 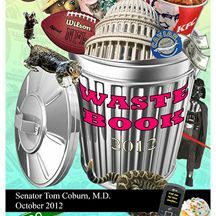 A Republican controlled congress needs to begin a systematic investigation of every wasteful project that Senator Coburn has listed in his book. This needs to go all the way back to his books from 2006 forward. The American people can no longer afford this type of waste.